Your business or leisure travels are taking you to the fascinating nation of Japan, and you will be spending time in the iconic city of Tokyo. After you’ve spent some time amid the hustle and bustle of this neon city, however, you may wish to get away for a time, relax, and find a slower pace. If this is true of your or your travel companions, a day trip from Tokyo to Kamakura may be just the thing for you. This delightful coastal town is located about an hour south of Tokyo, and is often called “the Kyoto of Eastern Japan”. Its beaches, historical structures, and monuments make Kamakura a go-to destination year round. The area is especially good for viewing cherry blossoms in the spring and colorful foliage in autumn. If using the Japan Rail Pass while traveling throughout the country, access to Kamakura from Tokyo is easy and affordable. Consider this informative travel guide when planning your next relaxing getaway. A visit to nearby Kamakura makes a great day trip from Tokyo. In order to travel from Tokyo to Kamakura using the JR Pass, you can take the JR Yokosuka Line, which is a direct connection from Tokyo Station to Kamakura Station. The trip includes stops at Shinagawa, Yokohama, and Kita-Kamakura stations, and lasts approximately one hour. Another option is the JR Shonan Shinjuku Line, which connects Shinjuku to Kamakura Station. This trip also takes about one hour, with two departures each hour. Some itineraries require a transfer to another train at Ofuna Station, while others are a direct connection to Kamakura. Non-JR rail options are also available, including Odakyu Railway’s Enoden train. This journey requires an extra thirty minutes, and is not, of course, covered by the JR Pass. Enoden’s streetcar train can be used to get around Kamakura itself. Most tourist attractions in Kamakura are concentrated around Kamakura Station and Kita-Kamakura Station. This makes for convenient outings on foot or using rental bicycles. In fact, most locations can be reached on foot in this small town. For more distant excursions or for those with special needs, buses and taxis are also available. 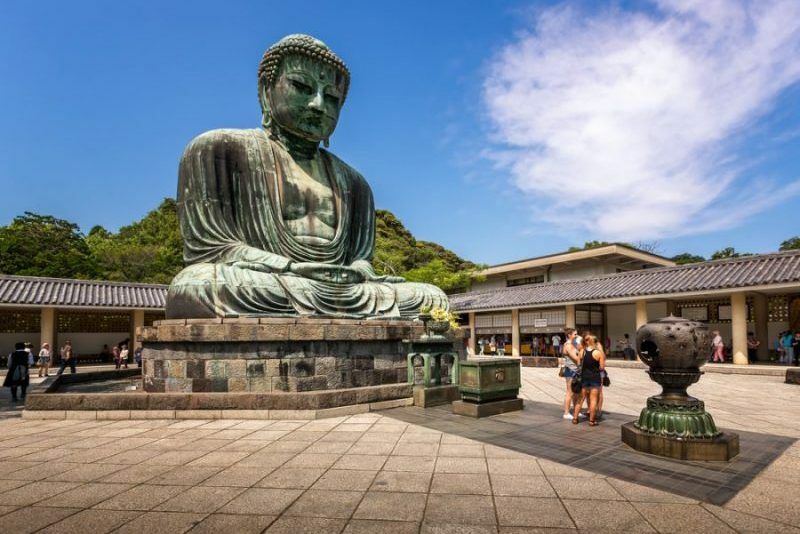 One of the primary attractions in the little town of Kamakura is the Big Buddha, also known as the Great Buddha or Daibutsu. The Buddha is a large bronze statue of Amida Buddha, cast in the year 1252. At more than 13 meters (42 feet) in height, it is the second largest bronze statue in Japan. The Buddha is located on the grounds of the Kotokuin Temple. The statue once dwelled inside a large temple hall, but the building was repeatedly destroyed by adverse weather, including multiple typhoons and a tidal wave. Since 1495, therefore, the Buddha has guarded the temple in the light of day. During the cherry blossom season, the statue is girded on one side by a lovely pink-blossomed tree. Numerous other temples dot the landscape around Kamakura. Kencho-ji temple, for example, is thought to be the oldest Zen training monastery in the country. 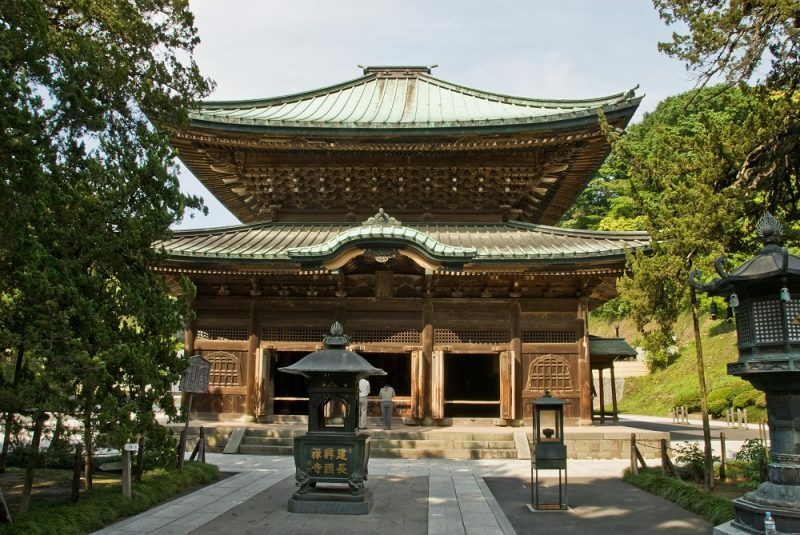 Some other temples can be reached by the wooded hiking trails that surround the city on three sides. From the Kotokuin Diabutsu, the Daibutsu Hiking Course connects with other temples, gardens, and statues on the western side of the city. This trail can be completed on foot in one to two hours. Similar hiking trails – the Tenen and Gintama Hiking Courses – in the northern and eastern hills offer visitors a glimpse of yagura, or cave tombs, temples, and shrines. These trails are coveted for the up-close viewing of autumn leaves in December. The shorter of the two trails can be completed in as little as thirty minutes. Finally, a trip to Kamakura would not be complete without a bit of time at the beach. Well over a kilometer of sand belonging to this coastal town tempts travelers with surfing, swimming, and sunbathing. The best time of year to visit Kamakura’s beaches is during the months of July and August, but they may also be crowded at this time. The beaches known as Zaimokuza and Yuigahama offer the best facilities, including rental shops, shade huts, showers, changing rooms, and refreshments. The beaches are a twenty-minute walk from the JR Kamakura Station. Whatever activities you pursue on your day trip to Kamakura, it is sure to be a getaway to remember. However, what will you do upon your return to Tokyo? While planning your next Japanese vacation, be sure to check out our Tokyo travel guide.